Ian Woolverton is a journalist working for the International Federation of Red Cross and Red Crescent Societies in Pakistan. 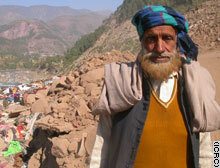 He contributed this story for CNN.com from one of the areas hardest hit by the South Asia earthquake. Winter is approaching and suitable tents are desperately needed. Balakot, Pakistan (CNN) -- Bring surgical masks I was warned. Now I know why. The stench of decomposing bodies hangs heavy on the air in Balakot, a town in Pakistan's north-west province. Set in a valley amid the stunning mountains of Kashmir, this was once a popular alpine tourist destination, the last stop before a hike in the mountains. Now Balakot lies ruined. Nothing more than an omelette of twisted metal and concrete. I helped Red Cross respond to the tsunami in Aceh last December. There, destruction in places such as Banda Aceh as well as Meulaboh was beyond comprehension. But this is different. Not one building stands in Balakot -- the air clogged thick with dust, the town, once home to 150,000, destroyed totally. The official death toll here will never be known but it could easily be tens of thousands. Imagine London or Paris obliterated. No hospital or medical staff to tend to the injured -- almost of all them save a handful of doctors and nurses crushed to death. No schools or teachers, nothing, not even the children. Many of them died in Balakot. They talk of a lost generation here. An entire community wiped out. Bizarre sights too. On a large slab of gray concrete perched on a bed of twisted steel, a man sits in a barber's chair for a beard and hair cut. Across the road a circle of men crane their necks to watch as relief workers tear eagerly at shattered timber and concertinaed concrete. Beneath a house, collapsed like a pack of cards, somebody's loved one. But the smell on the air is death. The gathered people know as well as I do it was a body to be exhumed. They are the audience in a macabre drama, a rare chance to escape their own desperate misery. Lying next to the road, the body of a woman covered in a white shroud. A crowd of men, perhaps her relatives, block our Land Cruiser and plead with us to take the body. Take the body where? It was a dreadful moment. I felt sick with shame as we gestured that we could not take her -- someone's wife, mother, daughter. It was heart wrenching. A moment I will never forget. So many bodies have been laid to rest here that burial land is hard to find. And strewn all over the streets, clothes of all shapes and sizes. So many clothes that frequently I walked on mounds of brightly colored fabrics. Apparently the Pakistan military had tossed the clothing from helicopters following the disaster. Little wonder. Balakot is hard to reach. Although the road from Islamabad, the nation's capital, is sealed, it twists and climbs and snakes and winds all the way through and over the mountains to the town. It took us four hours to drive some 170 kilometers to reach Balakot. And that's by four wheel drive. A truck laden with relief items would take longer. Getting sufficient aid to this and other stricken towns and villages even more remote than Balakot is a challenge. But there's no room for excuses. In Balakot and other earthquake areas we are getting aid to where it is needed most. Teams of Red Cross water engineers as well as doctors and nurses have established field hospitals and water distribution points in the town and elsewhere. On a green field, white Red Cross tents gleam in the bright sunshine. This basic health care facility, has seen over 500 patients since it opened. And on the day I arrived, people were queuing to be treated by Red Cross medical staff for all sorts of trauma such as fractures and psychological health problems including post traumatic stress disorder. A Red Cross doctor told me children are especially traumatized. Many have witnessed their parents and elders die or suffer horrendously. This is not an easy place to be for survivor or helper. Frequent aftershocks unnerve everyone, while landslides hurl rocks and debris down steep mountain slopes and turn river waters an ominous red. But the organization is determined to continue to meet the needs of those affected by a disaster the U.N. is describing as the world's worst ever. For the next six months we aim to meet the basic shelter and food needs of some 570,000 people. The challenges of mobilizing that much aid are huge. Ask any aid worker here what they fear the most and you will get the same answer -- the onset of winter. Exposure to the elements could kill more people than the earthquake. During daylight hours the temperature in the mountains can soar to the high 20s. But at night it plummets to five or six degrees. And it is going to get much colder very soon. Already snow is visible on the mountain peaks. But by mid November, winter will be upon the people whose houses, and lives, have been destroyed. Soon temperatures at night will drop below freezing. Priority number one, winterized tents. A winterized tent to shelter a family of seven from freezing temperatures costs only a couple of hundred dollars. Not much really. But it could mean the difference between life and death for quake survivors. I for one, hope the world does not fail them now. I had my moment of shame when faced with a plea to transport a dead body. For selfish reasons I hope to ease my sense of guilt knowing this winter Pakistan's earthquake survivors are sheltered from freezing temperatures and icy chills.